The end of any school year is tough no matter what sort of teacher you are or what kind of class you have, but with nearly 18 years of teaching now under my belt, I have learned a few things that will save your sanity at the end of the school year! It is super important to remember that throughout the school year you provide a safe place for your students. Not all of them have happy, easy home lives and the structure, routine and predictability that you provide in your classroom makes their little lives easier. Sticking to your schedule, giving advance notice of any major changes, and continuing with daily routines is a great way to keep your students from falling off the rails with weeks or months to go. It can’t be all fun and games for the last six weeks of the school year, nor should it be. In my classroom, I keep my students working as much as possible until the bitter end. This isn’t easy to do, particularly once report cards are finished and everything feels a little like “busy work”, but if you are creative you’ll be just fine. I like to pull out our Memory Books – they take days to fully complete and give my students an opportunity to reflect on the great times we’ve had throughout the year. 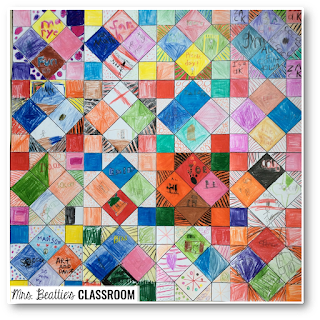 Collaborative art activities like this Memory Quilt are also fun! 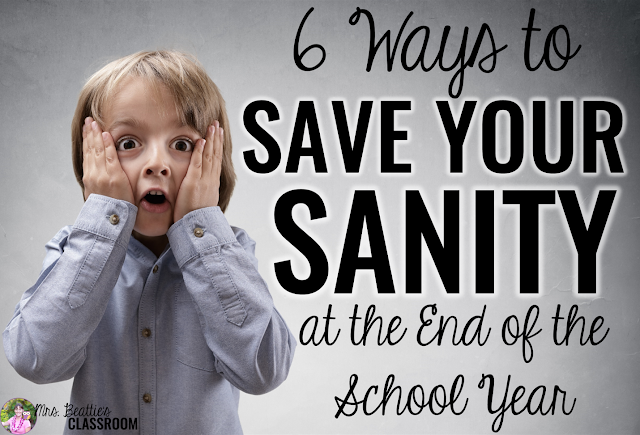 I know that many of us get to a place in the spring where we are starting to think about next year already, or at the very least are anticipating running out the school doors on the last day and not looking back until September. We have a list of things we want to have accomplished before that time and that includes packing up the classroom. I think it is important to not start shutting your classroom down too early for the same reasons that you shouldn’t let your routines go. 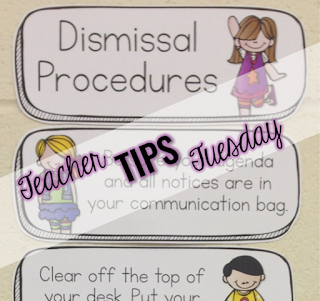 If students walk into an empty space because you’ve started pulling your anchor charts and décor down, you’ve sent them a message: “I’m done, so you might as well be done too.” Not a message you want to send with weeks or even days still to go. With that said, I know that packing a classroom up at the end of the school year is best done when you have 20 or 25 willing little pairs of helping hands to make it easier. I ALWAYS do the majority of the job with my students’ help. This keeps them busy, gives them shared ownership over this space that you’ve shared for ten months, and allows them some closure as summer draws near. In my classroom, as the end of the year draws nearer my students start to look and sound like little whirlwinds. Some are clearly very excited while others are anxious and acting out. Hard as it may be, I make sure that I am consistent with enforcing all of my classroom rules and expectations, and continue to deliver consequences as needed. This goes hand-in-hand with the predictable routine. If it wasn’t okay to blurt out answers before, then it shouldn’t be okay at the end of the school year. Of course the end of the school year should also be fun!! You’re not a drill sergeant – you’re currently one of the most important individuals in the lives of these little people and they are going to miss you terribly. Have some fun with them. Go on a field trip, have a picnic, do some things outside of your normal routine to celebrate the time you spent together. One of my favorite things to do is an ABC Countdown to the end of the school year. For the last 26 days, every new day has a special spin on it. These are really small, manageable events like Animal Day where students get to bring a stuffed animal, Beach Day or Crazy Hair Day - the day is really business as usual, but the kids don’t realize that! If you’re already done for the year – have a wonderful summer! If you’re in the final days or weeks – I hope you’ve found something here that saves your sanity as you count the days to your well-deserved vacation! Enjoy this post? Pin it to share with your friends and followers! 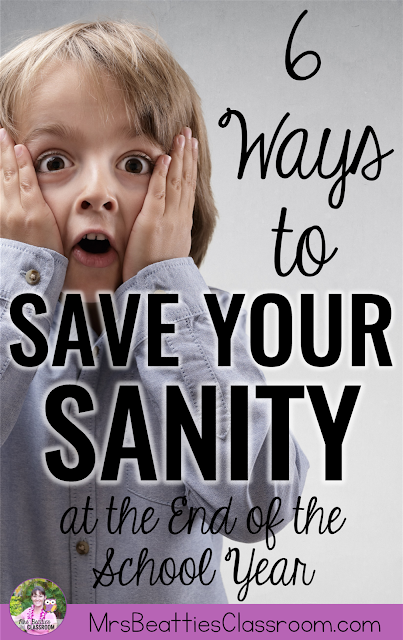 You might also be interested in knowing more about how you can save your sanity during daily classroom dismissal! These are the same tips and tricks I've discovered over the years. Thanks for summing them up in one place in such a fun way! I pinned your blog post in TWO places! Have a great end of year. I have 9 busy, structured but fun days left!